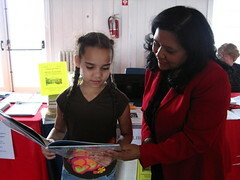 On Friday, March 5, 2010, OLA (Organización Latino-Americana) sponsored a community fair at the Bridgehampton Community House in Bridgehampton. The John Jermain Memorial Library’s Aracely Garcia was there representing the library with a display table highlighting the library’s programs for the Latino community. Aracely says that JJML’s table was the busiest at the fair. Fairgoers showed much interest in our programming, materials and reference services.